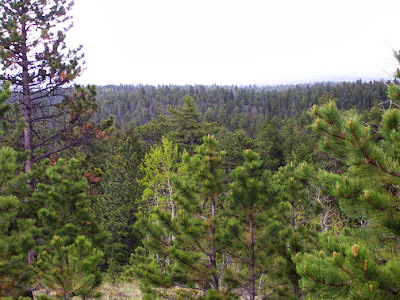 When I lived further north, I spent a lot of time on the Pike National Forest, and by "the Pike" in this context I mean chiefly the Pike's Peak Ranger District and the southern part of the South Platte Ranger District — in other words, an area northwest of Colorado Springs and southwest of Denver. I camped, hiked, and hunted. I planted trees with the Boy Scouts, trees that probably burned in one of the many forest fires in the Buffalo Creek area since those days. But I never loved it. When I saw views that opened up after the big Hayman Fire in 2002, I kind of thought that was an improvement, heretical as it may sound. 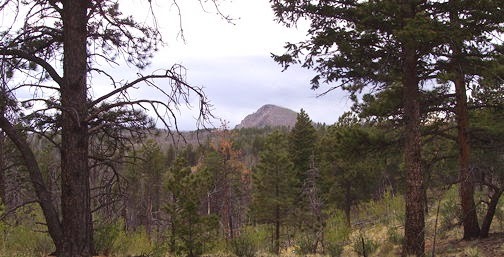 Signal Butte rises north of Florissant, Colorado. 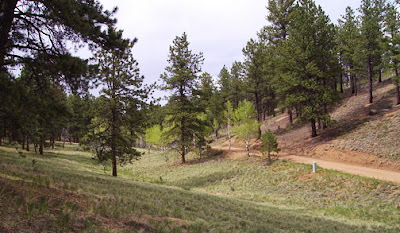 M. and I went back to the Pike last month — we were camping with friends near Florissant, and we took a day to reacquaint ourselves with that corner of the forest, see some places that we had not seen since our days in Manitou Springs, and just get out and walk in the woods. A typical forest road in a typical draw on the Pike. Somehow, driving and walking — and seeing different vistas of the burn — kind of put me at ease. I felt a little more like I knew the place — or could know it, if I wanted to spend the time. But I probably won't. I like it here better.